My friend Tracy loves all things sparkly. 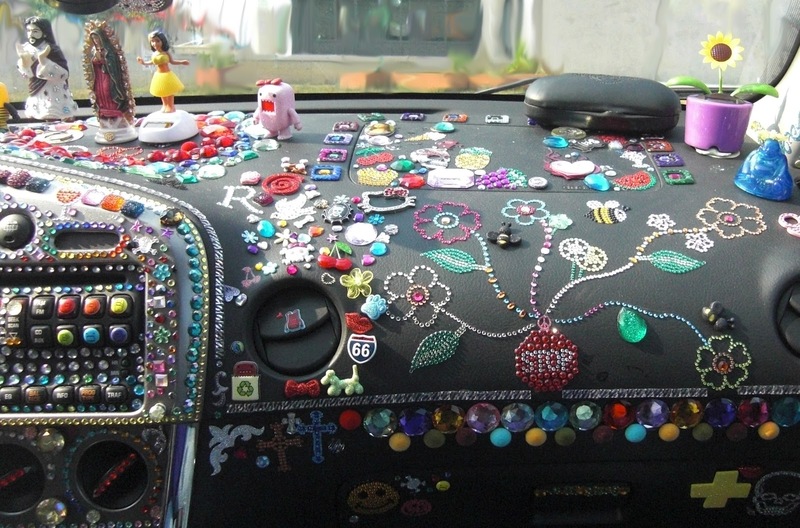 Her car's dashboard is a wonder to behold. Saints and hula girls wiggle and wobble amidst a garden of beads, jewels, glittery stickers and teeny tiny "yard art" figurines. Being an artist is a 24-hour thing. The creative drive includes the need to organize and alter one's environment. Most people spend a large part of each day in their cars, a cage of boring black plastic, chrome and vinyl. The impulse to decorate, to ornament, to arrange bits of glass and plastic in colorful patterns makes perfect sense to me. 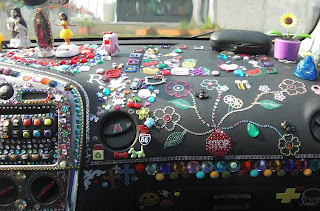 It's the car of an artist and a true Art Car.